Art & Frame of Sarasota: Weekly Specials: November 19-24th! Fredrix Canvas- 50% off list! Itoya Portfolios- 40% off list! 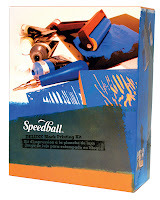 Speedball Silkscreen & Block Printing Supplies- 30% off list! Did you know you can make your own stamps with Speedball block printing supplies? Watch the video below to see how it's done! All you need are a few tools and your design! Tools: a block for carving, a carving tool, ink, and your design!